Sumos is a leading food machinery manufacturer in Malaysia. 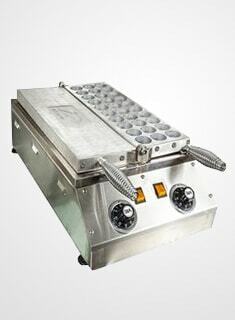 We offer a variety of different food and snacks machinery, among which includes waffle machines. Our waffle machines are designs with different innovative designs like the flat and grooved plate options, all equipped with timer (0 – 5 minutes) and detachable spring handle. We can also make custom assembly catered to your needs and requirements. These are all manufactured with premium high strength cast iron heating plates with upper and lower heating, to ensure the most consistent and complete heating. Our waffle machines and other food machinery come with power switch and thermostat, providing double protection over your cooking sessions. On top of all the essential features, the machines are equipped with oil box for energy conservation; glass fiber innings to keep warmth and insulated heat proof handle for maximum safety measures during operation. Equipped with timer (0 – 5 mins), detachable spring handle. High strength cast iron heating plate material, upper and lower heating. Flat and grooved plates available, assembled by your requirements. Height automatically adjusted for different food. Power switch and thermostat, double protection. With oil box for energy conservation. Glass fiber inside to keep warming. Insolated and heat-proof handle for safe operation.